No matter which blog site you use, some readers are always going to have a problem with commenting. It’s so frustrating! I can see comments successfully made on my posts, so I know the site isn’t broken. And the readers who can’t comment on my posts seem to be able to comment on everyone else’s sites just fine! So I thought I would do a run-down on how to comment on WordPress blogs, and how to set up your site for easy commenting, if you are a new WordPress blogger. First of all, I will tell you my settings. It is possible for bloggers not to allow comments at all, or to stop allowing comments on a post at any time. My posts always allow comments and I have never “closed” a post to further commenting. I have the option to automatically approve every comment so it goes right on the blog before I even see it. Or, I can demand that every comment waits for my personal approval. I read it, decide if it’s OK to publish, and approve it so it gets published to the site. I have chosen an intermediate option. If you are commenting for the first time, I make you wait for approval. Once I trust you and know your comments are “legit,” all your future comments are automatically approved if they come from the same email address. If you comment using a different email address, you are treated like a new commenter until I approve that email address too. WordPress has a spam filter called Akismet, which is always running. It automatically sends suspicious comments to the spam folder. I review them 2 or 3 times a week to see if any genuine comments have been blocked. If so, I approve them. I am very happy with Akismet. Maybe 1 out of 100 spam comments gets through, if it is very clever and looks more real than the others – for example, if it uses good grammar! If you are not a blogger, you should know that blogs get hundreds of spam comments a day, usually including dozens of links to bogus websites, advertising, malware, and so on. If we didn’t screen them out, the real comments would be buried! One hint for ensuring your comments get through is to make sure they don’t resemble spam. A lot of “spammers” have an email address in this format: anexactinglife(at)anexactinglife.com (not a real email address!) So if you have a blog or a web site and your email address resembles this, your comment is more likely to get sent to the spam folder. If this happens on my site, I will almost surely find it in the spam folder and approve it, but some bloggers automatically delete everything marked as spam. If you do have an email address in this unfortunate format, you may need to use a different email address to comment on some sites, such as a personal email address. If you have a gmail, hotmail, or yahoo email address in the usual format, such as anexactinglife(at)gmail.com, your comment is more likely to go through. 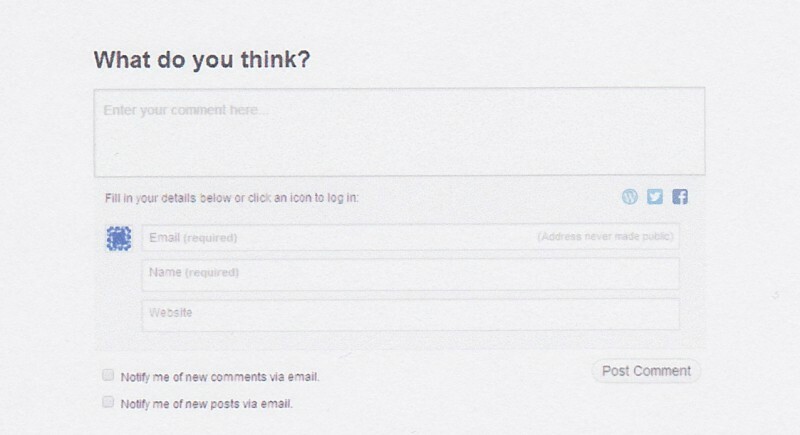 If you have a WordPress account and you are logged on, you can comment without filling in a form. At the end of the 4th box (labelled BLOG ADDRESS), look for and click the link SIGN UP FOR JUST A USERNAME. Register to create an account used just for commenting. If you don’t have or want either type of WordPress account, you will need to fill out a form each time you comment. My blog asks for your name, email address and website when you enter a comment. I have the option to let comments through without a name and email address, but I choose not to – then all of the comments would be anonymous, and it might encourage commenters that didn’t want to be held accountable. Typing in a name is required. For your name, you can type your real name, nickname, blog name, online identity name, or whatever you like. However, if you use the same name each time you comment, the blog owner and other readers will get to know you better! Your email address should be in the usual format such as anexactinglife(at)gmail.com If there is an error in the email address, such as typing in “gmial.com,” WordPress doesn’t seem to notice. Adding a website name is NOT required. It is a feature for commenters who want to promote their blog or website. You should enter it in this format: http://anexactinglife.com Then, if anyone clicks on the commenter’s name, it will go right to their blog/website so you can find out more about them! Stop right there: this is the trouble shooting point! If you are a first-time commenter and you DON’T get a message like this, your comment has not gone through! Something is wrong. Very rarely, WordPress has some down time and no comments will work. But this really is uncommon. When it happens to me, it’s usually because of a glitch, such as: I accidentally navigated away from the comment page, or my Internet connection cut out, or I think I clicked POST COMMENT but I actually didn’t. I have to admit there are times I try to post a comment to someone’s site, and I truly don’t understand why it doesn’t go through. Maybe their server is getting too much traffic? Maybe their site is down? How do you know if your comment has been approved? I usually check, approve and answer comments 2 or 3 times a day, so within a day, you will see your comment (and my reply!) under the post. This is something I do manually so you have to wait in “real time” for a reply! If you are logged on to WordPress or you have commented before, you will get a brief message after you click POST COMMENT that will say posting comment and then it will appear, so that process is quite obvious. You can also comment on WordPress blogs by logging into one of your social media accounts. These options are not easy to see. Under the comments area, there is a tiny row of icons: “Fill in your details below or click an icon to log in,” showing choices such as WordPress, Facebook, Twitter and Google+. The blogger decides which ones to enable. If you log in, a line will appear saying, “You are commenting using your Facebook (etc.) account.” Your Facebook (etc.) page link gets automatically added to your comment. 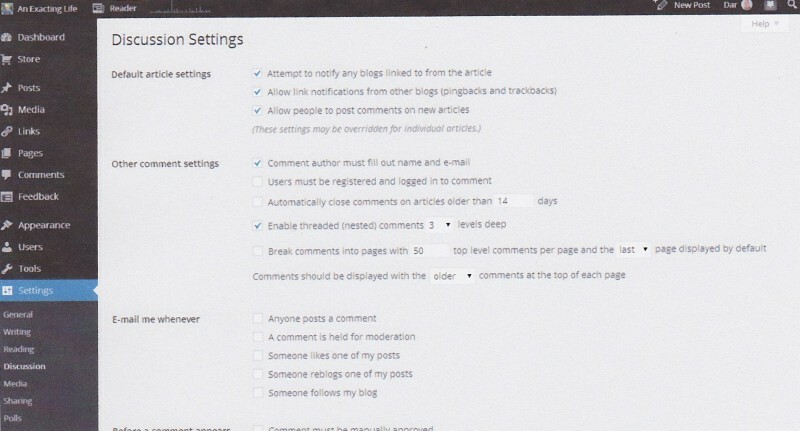 If you stay logged in, you can comment on lots of different blogs without filling in another form. If you do have a blog or website, type in the site, such as http://janesblog.blogger.com (nonexistent blog) in the website box each time you comment. Then, whenever someone clicks the name Jane Smith above your comment, they will go to your blog/website. Do other readers really do that? Absolutely! I have found dozens of great blogs written by my commenters. Lots of my readers who aren’t bloggers also follow name links of other like-minded commenters to find new blogs. One hint is to use your blog name in the NAME box instead of your real name. For example, if I comment on someone’s blog using my name “Dar” or using my blog name “An Exacting Life,” readers are more likely to click on my blog name, because, well, it sounds like a blog! You can also comment using a Facebook, Twitter or Google+ account that you created specifically for your blog or website. I’ve noticed that Blogger offers the OpenID system which allows you to comment as a WordPress user. WordPress doesn’t allow you to comment as a Blogger user per se, but you can use Google+, if the blogger has enabled it. I use the free, built-in commenting that comes with WordPress.com. It is also possible for bloggers to switch to another “brand name” commenting system such as Disqus or Intense Debate. I haven’t done this because they are only available as plug-ins for WordPress.org accounts (the self-hosted/advanced ones) or other blog platforms. Disqus and Intense Debate require you to register and make an account with them so you can comment. You log in each time you want to comment. You could just stay logged in if you read a lot of blogs that use Disqus or Intense Debate. OK, that is everything I know about commenting on WordPress! Let me know what questions you still have, and I will try to find out the answers. Except this one: “I’ve done everything you say, but my comments still don’t appear on your blog!” If that is true, I regret I am completely baffled! As a last, last resort, I do one of three things: close a bunch of windows and programs so not so much is running, close my browser and try a different one (such as switching from Chrome to Firefox) or…restart my computer…the low-tech answers! Thanks to Lois at The Eco-Grandma for the inspiration for this post here and here. Thanks, Dar – such a comprehensive coverage of how blogs and comments work. I think I need to link to this. The only thing I’d add is a note about comments with blog settings. Naturally, you have to be incredibly careful about what traffic/comments you attract via search terms on your blog. And it is possible to have a blog but have it ‘not indexed to Google’ (like mine) because you might NOT want random passers-by that can come in and wreak havoc in the comments box. Very true, Fiona, but hard to deal with. If your blog is indexed, then the entire content is searchable, not just the categories and tags. A case in point is that I once briefly mentioned Aaron Taylor Johnson in a post, and to this day my blog still gets a bit of traffic because of it. You might think that’s a good thing, but my blog has very little “celebrity” content, so I am sure whoever visits for that reason is disappointed. I could have capitalized by doing a post about him, but that would have been strictly calculated to get views, and I have no interest in doing that! On the negative side, a word that has some relation to the trans community appears somewhere in my comments (by a commenter), and I keep getting “hits” by people looking for that term, even though I long since edited it out? Which means, I suppose, that someone linked to it. Otherwise, no one can really wreak havoc because I would see and have to approve their first comment. The worst that could happen is that I would have to keep deleting pesky comments from a very persistent troll (I know Krystal from Give Me Back My Five Bucks has one, and it must be very tiresome). I haven’t visited any LOLcats in quite a while, but recently Rom watched a Maru video for the first time in ages…so cute! Excellent post! I have noticed that switching browsers does help on leaving comments. I like your hint about changing your real name to your blogger name/website to attract more visitors. Thanks again for sharing! I somehow ended up with intensedebate, I think it was because I used it on Pauline’s site, perhaps, and always got an email when it was replied to, and thought my readers would enjoy that feature. Truth is, as a blogger, it’s harder not easier for me 😦 I always seem to have some login disconnect between the two, and now can’t ’email reply’ to comments like the good old days. That being said, Blogger comes with it’s own dramas. The number of times I’ve ‘signed out’ of Giraffe Life’s blog rather than posting are too numerous to count! Now a weird question – why does my task bar show two unread comments (top left in the black bit), but no in the left menu bar? Last time I tried, I even cleared out spam, and went through the last few pages of posts to see if there was a ping back that might have caused it, but all for naught. You upgraded to WordPress.org, right? So far I have chosen not to because although some plug-ins would be nice, I don’t have the time or skills to customize the site very much. I never have any problem commenting on your site with Intense Debate. Blogger gives loads of options for commenting but (in my opinion) it seems to have a lot of downtime. There are times I am sure I’m doing everything right, but the comments just won’t go through. Sometimes what I do is copy the content of my comment before I send it. Then if it doesn’t go through, I can try again, and paste the comment back in so I don’t have to start over. I find using OpenID to comment often takes two tries. I suppose my “pet peeve” with Blogger is that just about all the blogs require a captcha every time you comment, so they never “trust” you, no matter how often you visit. I wonder if that setting can be changed. I find that from the time I click SUBMIT to the time it goes through, the captcha keeps changing and I often have to type in 3 of them before it “takes”! About the mysterious unread comments, the only thing I can think of is that they are in the “trash” folder? I do find that if there are a lot of notifications waiting, that the bottom ones drop off the top left notification area due to “lack of room,” but they usually still appear in the comments menu in the dashboard (opposite to what you describe). Anyone else have any ideas on that? I don’t know if on Blogger, there is an option to require approval for someone’s first comment and then let the rest through. I do the copy and paste trick too, Dar! One note about the captcha on blogger – the author/blogger can’t see it when commenting or responding on their own blog. (I didn’t realize mine was turned on until a reader told me.) It can be turned off for everyone, or turned on for everyone, but no middle ground with “trusted” or “regular” commenters. Thanks for letting me know about the Blogger captcha situation; I always wondered! Sorry about the comments glitch. I think Sunday night is the busiest time of the week for blog reading and commenting – relaxing before the work week? Note to Readers: This morning I had 96 spam comments and none of them were genuine, so I deleted them all. If you tried to comment to this post, and your comment didn’t appear or get queued up for moderation, that means it didn’t go through. You could let me know through email or Facebook! I have put in place that you have to be signed up with WordPress, Facebook, or Google+ (I refuse to post Twitter users because you can’t verify people) to weed out trolls. I sometimes leave very flaming comments on other blogs—if you post something controversial and have comments enabled, be prepared for an equally upsetting comment!—and before doing so, would have people leave comments unrelated to my material about else where I posted. From Day 1, I always expected to get my share of negative comments but it hasn’t happened – too under the radar, I think! But I know I have left myself open to them, and it seems OK for now. Facebook is its own universe. There are so many people who “do” Facebook but don’t read blogs and don’t know how to interact with them. Dar, I never knew how to comment with a WordPress account if I didn’t have a blog. I learn something new every day. One of the reasons I got fed up with WordPress is that the spam was no longer being caught and sent to the spam folder. i checked that all my settings were right but getting hundreds of comments awaiting moderation a day was too much. I wonder what happened there, Lois? I get about 100 spam comments a day but they all get sent to the spam folder so I can delete them. I wonder if WordPress tech support is helpful – but I guess as a free account holder you can only get help from the forums. Weirdly, that article refers to a useful volunteer project rather than a money-making effort! I never think about the companies who create these kinds of services. That is such an informative post – I think you have covered everything and all I can say now is No comment! Perhaps you could now cover how to find the comment box to leave a comment on other peoples blogs. I have just changed wordpress themes and discovered it does not show a comment box or a comment count on the front reader page instead it seems you have to click onto the post title before the comments and comment box are visible – not sure if a lot of people will know that and I am not sure I like it either – so may be on the search for another theme soon! 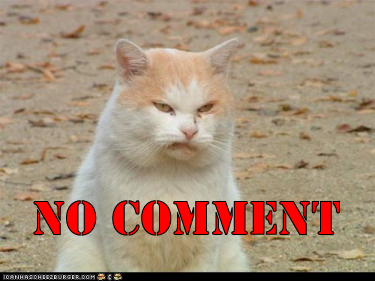 I just read your latest post from the WordPress Reader and it did provide a comments box and comments count! Thats funny because I cannot see it! I guess I didn’t look at the Reader very closely. None of the posts have a comments box on the first screen – I always have to click on the post title to read the post and comment on it. I would think anyone with a WordPress account would know to do that. I’m surprised you were previously able to do that on the first screen! Also, I don’t think it’s possible to know how your own posts look in your own reader, unless perhaps you follow yourself. I love how Blogger and WordPress sometimes randomly block comments or put comments them in spam from the other platform. And I love how spammers hit in bulk. I’ll get heaps on buying luxury cars all at once. Then nothing for days. Yes, I have no doubt that WordPress and Blogger deliberately try to confound each other’s users. They are competitors, after all! Most of my spam is about sales on boots and handbags – I guess because I do some posts on clothing.